Last week video footage and photographs from a training accident of a Merkava 4 unit was released. During a firing excersice, a Merkava 4 main battle tank (MBT) drives in front of another one, which was shooting a 120 mm M392 APAM round. APAM stands for anti-personnel/anti-materiel and is the designation given to the current high-end multi-purpose ammunition of the IDF. The M392 APAM consists of a 17 kilograms ( ~37 lb) heavy projectile, which is accelerated by a reduced propellant charge to a muzzle velocity of 900 metres per second. The maximum chamber pressure while firing a APAM round is only 340 MPa (3400 bar). The APAM projectile has a modular design and can contain up to 6 sub-munitions (warheads), which usually contain a high explosive (HE) filler. Thanks to a programmable electronic fuze, APAM can be used for a variety of task in different modes including a mode for detonation at impact, air-burst and detonation after sub-munition ejection. According to Israeli sources no member of the tank's crew was injured. The Merkava 4 is known for relying on adapted special armor instead of integrated special armor. Most conventional tanks - including the M1 Abrams, the Leopard 2 and the T-90 - utilize integrated composite armor or a combination of integrated and adapted armor. This means the steel casings for turret and hull are manufactured with double walls, which are spaced apart. The composite armor modules are then inserted into the hollow sections between the steel walls, which is closed thereafter by welding/bolting a roof section ontop. The steel walls of the turret and hull casing provide structural support and additional armor protection, however they add weight and make repairs more cumbersome. The Merkava 4's turret is made from steel, but only has a single steel wall. This is usually a design commonly used on lighter armored vehicles (like IFVs and APCs) or older vehicles later retrofitted with special armor. The composite armor is mounted in form of separate modules at the exterior of the tank. This allows an easier replacement and easier upgrades of the composite armor modules. However it seems that the implementation of the adapted special armor design on the Merkava 4 has some flaws. 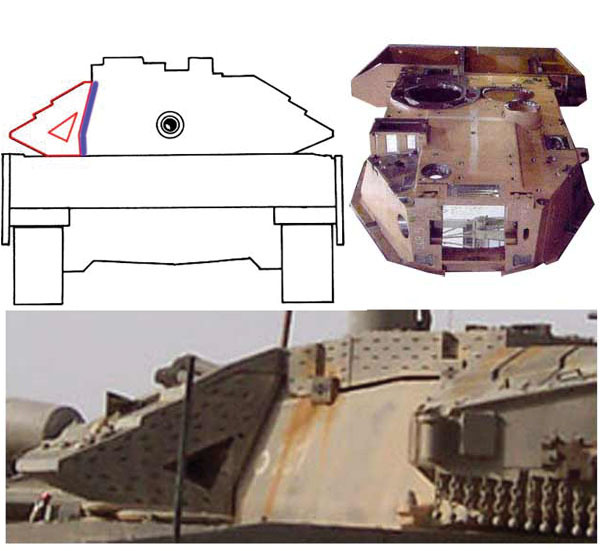 The Merkava's composite armor consists of many thin spaced sandwich plates, which is a common design for protection against HEAT warheads. 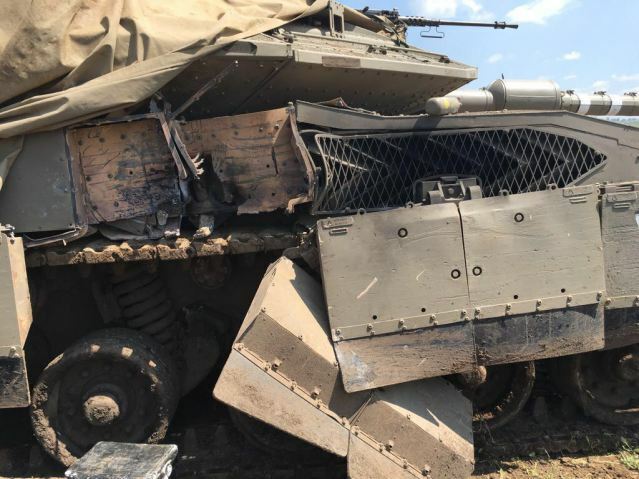 However the lack of a thick coverplate providing additional protection against KE, detonating warheads before they enter the composite armor and providing additional structural support causes some issues not found on other tanks. Compared to other tanks, the Merkava 4's armor (and similar armor used to upgrade older tanks) takes considerable amounts of damage after a single hit. Above is a comparision of a M1A1 HA hit by a Maverick ATGM (an attempt to destroy the immobilized tank in order to prevent the tank being captured) and a Merkava 4 after being hit by a 9M133 Kornet (AT-14 Spriggan) missile. The difference at the exterior is huge - while the M1A1HA has only a single hole (~2-3 inch diameter) in the armor's cover plate, a large portion of the Merkava 4's armor is damaged and some elements are even missing. This means a larger portion of the tank's armor is weakened and allows the enemy to specifically target the weakened sections of the tank (at closer ranges at least). Most of the damage to the Merkava's armor is not caused by the metal jet formed by the shaped charge's copper liner, but rather the detonation of the high explosive used to form it. Ironically the British engineers of the FVRDE already knew of this problem in 1969 when developing a Chobham armor upgrade for the Chieftain. The Merkava 3's different armor design also does not seem to share this problem. Thus it appears that this is a known disadvantage, intentionally accepted in order to keep the tank's weight at an acceptable level. The M1A1 HA's composite armor is only damaged by the copper jet formed by the shaped charge's liner. The HE used to accelerate it does only cause cosmetic damage to the exterior. As previously written, APAM uses a reduced propellant charge and operates only with a pressure of 340 MPa. This is considerable less than a DM12 HEAT round (M830 in US service), which operates with a full charge at 480 MPa. Given the weight and velocity, it seems likely that the current German multi-purpose ammunition - the DM11 (also used by the USMC and others) - should operate at a similar pressure level. Soviet/Russian 125 mm HE rounds have comparable kinetic energy. 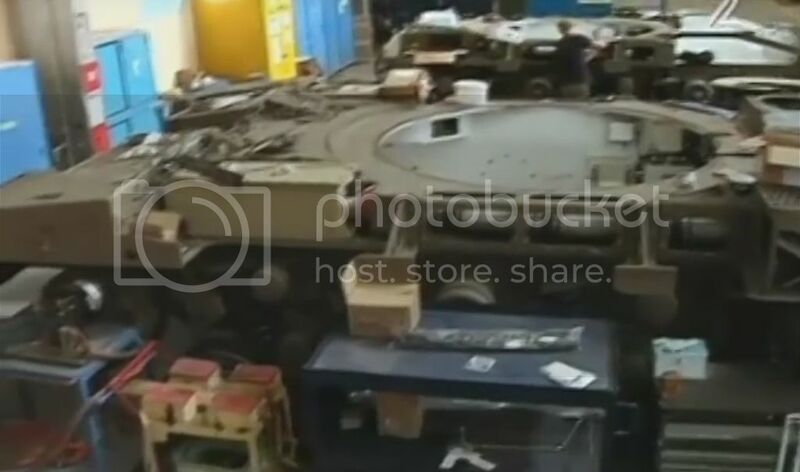 So seeing how a APAM can nearly penetrate a Merkava 4's armor (here is a Merkava hull without armor) or maybe even penetrate it (official statement only says nobody injured), it seems very likely that other multi-purpose ammuntion could completely penetrate the side armor of a Merkava - depsite there being an approximately 300 mm thick composite armor module (~1 foot of armor module). 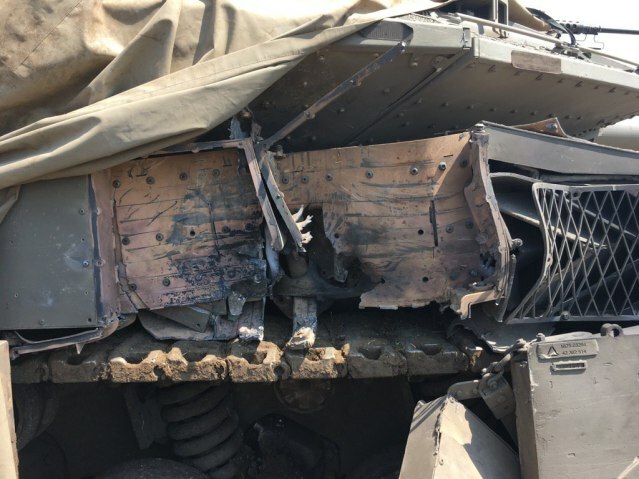 As HE/multi-purpose ammunition should only penetrate lightly armored vehicles and structures (a double-layered concrete wall offers less protection than 70 mm steel armor) this raises some questions about the IDF's priorities and the combat value of the Merkava in other types of conflicts. To be fair most other tanks don't have armor at this exact location where the Merkava 4 was hit - that is the result of most tanks being optimized for tank-vs-tank combat or high intensity conflicts at least. Such conflicts require thick and heavy frontal armor, so that not much weight can be utilized for side armor. The early Merkava tanks (including the intial model of the Merkava 3) also followed this design, as they were primarily meant to fight the numerical superiority of the tank force of the Arab nations. The Merkava 4 however was designed primarily for a new type of warfare, to fight in the assymetrical warfare against HAMAS and allies. This meant that heavy frontal armor was not necessary and allround protection against RPGs and ATGMs was only required. The Merkava 4 seems to have sacrificed conventional armor protection in order to meet the current requirements of the IDF, but how well would it fare against the new tanks of the region: M1A1s in Egypt, Challenger 1s in Jordan (with upgrades being in development) and T-90s in Syria? PS: According to some people on the internet claiming to belong to the IDF, the training rounds fired might not have been APAM rounds, as originally claimed by other sources, but an inert HEAT-TP rounds. Unfortunately it's impossible to prove or disprove any of the stories, but informations posted by random persons on the internet always have to be taken with care. Do you have any photo of the damaged tank? the one you posted was taken down! I fixed it. Hopefully the hosting website doesn't take them down again. Interesting. I'm sure the Merkava Mk4s frontal armor is still quite thick, but the be realistic, the most likely threat to a Merkava in regards to tanks is a T-72M1 or a T-72B. Both Jordan and Egypt know that a war with Israel wouldn't end well for them. The Royal Jordanian Army has about 380 Challenger nowadays. And in 1967 equipped with M-48 during Six-day war, they were about to destroy Israel's armored forces. Few things ..from a former israeli soldier who knows the mk4 3 and not just from a tanker point of view. In order to hit there you will have to first find one stupid mk crew..rarely will it happen. To the point though.. the data on which your rely is extremely unaccurate. 1.its not the m392 but a mark 2 variant developed and used by israel inth 80's...specs are very different. 2.it was built vs tanks..not personal,though it was used in that manner as well for a few years. 3.that shot you see is under training exercise where some high ranks lost their job as a result of not only the shooting but a few other notable unforgivable errors in judgment. A.no defense system was active . B.the tanks .this one in particular,was without the normal extra plating it has during combat. A thing you can clearly see on the pictures as there is no sign for even the heavy side plates .not to mention the extra reactive plating that is also missing. 4.as for materials...i will not go into stats but just say even a kornet hit from any angle on the front side,will ,at best, reach the engine .tank will still work. As a side point I know a lot of people try to take 2006 as a case study for the Israeli tanks performance, but bare in mind that the chief of staff was deposed shamefully along with some other high ranks,and the pm from that war ended up in jail...mostly due to simply throwing away all the training a well made doctrines and doing idioitic things like putting tanks ahead of any support and basically making them a target practice...israeli tank will never drive off ahead like that normally, and if even attacked from the sides..it means that the supporting troops or tank crew made some huge error. I hope that illuminates some data.